Donegal Glass | Donegals No.1 Glass, Shopfront, Letterkenny Rd Showroom. 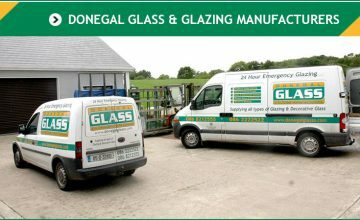 Donegal Glass & Glazing Manufacturers LTD, Letterkenny Road Stranorlar, Co Donegal, are the Northwest leading independent glass company. Due to our independent status, we can offer a fantastic array of glass products and glazing solutions. We also offer a Supply & Fitting service, Maintenance Contract, Complete Design, Management, and Installation Package as well as 24/7 emergency call out service. Donegal Glass supplies and fits only the highest quality glass for all types of projects from residential homes to commercial businesses. From stairs to showers, stoves to shelving and shops fronts to mirrors to we offer a vast array of Glass Products for you home or business. Made using only the best materials at Donegal Glass we provide a huge selection of secure and energy efficient uPVC windows and Doors.
" Donegal Glass provided such a great service to us. They talked us through so many options to provide the best possible solution for us. We are very happy customers. " " I’d recommended Donegal Glass to any business, they provide a fantastic service and extremely high-quality products. There are always available to us at short notice and prompt in replying to our requests. "